A database that aims to track information on action that public authorities have taken on air pollution, using construction activities as a case study. Vidhi Centre for Legal Policy, Karnataka would like to invite you to attend a panel discussion on "The Right to Breathe- Fixing Bengaluru's Air" on 11th January 2019 at Bangalore International Centre Domlur. The panel discussion is part of a public engagement series on "Bengaluru Solutions" jointly organized by Vidhi and Citizen Matters in collaboration with Bangalore International Centre. In 2017, Vidhi published Cleaning Delhi’s Air: Implementation Action Plan, that identified legal and executive pathways to implement already identified solutions to improve Delhi’s air quality. This year, Vidhi Delhi has created a database, ‘Biting the Dust’, to track the monitoring and enforcement action taken by public authorities to track air pollution in the Delhi NCR. This winter season has shown to many Bengalureans that the quality of city's air is declining and much needs to be done to improve it. In a recent report published by Climate Trends, it has shown Bengaluru to be most impacted by Vehicular pollution in the country. The report also recognizes the need for better governance and regulations to combat air pollution in the City. This discussion is an attempt to shed light on the problem and identify solutions on the growing concern surrounding the quality of Bengaluru's Air. For the discussion we are pleased to have a diverse panel of Mr Randeep D, IAS & Special Commissioner BBMP, Mr Pawan Mulukutla, Head of City Development Bosch Mobility Solutions and Anjali Saini Member of Whitefield Rising. 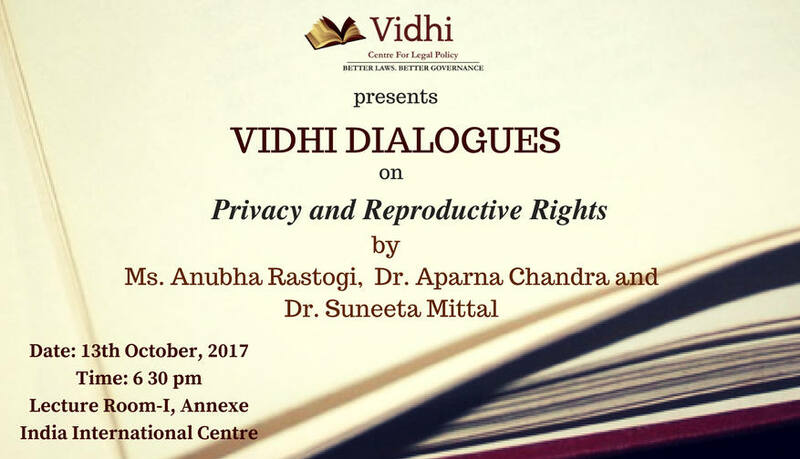 The Vidhi Centre for Legal Policy is turning five this December. To mark this occasion, we are organising our first Annual Summit titled, ‘Deepening Dialogue’. True to our ethos, the Summit brings together judges, academics, civil society groups, bureaucrats and friends of Vidhi to share their views on diverse and contemporary policies of our time. The Summit will feature keynote speakers and panels of thought leaders who will engage in conversations on the public policy challenges and opportunities that lie ahead of us. A dramatic performance scripted by Nyaaya on sexual harassment at the work place. Except the Conference on Insolvency and Bankruptcy Code, all events are open to the public but require prior registration. Please select the sessions you would like to attend in this registration form, here. ET Now is our media partner for the Summit. To mark the upcoming International Day against Homophobia, Transphobia and Biphobia (IDAHOTB) India HIV/AIDS Alliance and the Vidhi Centre For Legal Policy, are organizing a day-long ‘National Solidarity Event- The Law Isnt Straight’ under Samarth programme addressing stigma and discrimination towards sexual minority people. We look forward to your august presence. Download the detailed agenda here. Vidhi Bengaluru celebrated the occasion of its first Briefing Book launch titled "15 Legal Reforms for Karnataka". The launch of the book shall be followed by a panel discussion on the topic: “Towards a Better Bengaluru, Reforming Urban Governance in Karnataka"
Justice (Retd.) Santosh Hegde (Former Justice of the Supreme Court of India and Former Lokayukta, Karnataka), Rohini Nilekani, (Philanthropist) and Dr. A Ravindra, Former Chief Secretary, Government Of Karnataka were the panelist for the event. The event also marked the release of three reports - a study of financing of urban local bodies of Karnataka, a study of Karnataka High Court's writ jurisdiction and waste picker welfare law in Karnataka. The event was organised on 16th February, 2017 at 06:00 pm at the Mother Tekla Auditorium. Download the Briefing Book here. Vidhi responded to a call for public comments on the draft Uttar Pradesh Self-Financed Independent Schools (Regulation of Fees) Bill, 2017. Vidhi’s submissions critiqued the Bill based on inconsistency with existing legal frameworks and Supreme Court decisions, as well as pari materia legislations on fee regulation across different States. The submissions recommend several changes to the existing Bill based on the above analysis. Vidhi’s submissions can be accessed here. The public debate was moderated by Mr. Rajdeep Sardesai (Consulting Editor, India Today Group). The speakers included Ms. Madhavi Divan (Advocate, Supreme Court of India), Mr. Sidharth Chauhan (Asst. Professor, NALSAR University of Law, Hyderabad), Mr. Baijayant “Jay” Panda (Hon’ble Member of Parliament), Mr. Swapan Dasgupta (Hon’ble Member of Parliament), Ms. Shruti Kapila (University Lecturer, Cambridge University) and, Mr. Alok Prasanna (Senior Resident Fellow, Vidhi). Vidhi celebrated the occasion of its fourth anniversary with the launch of its fourth Briefing Book titled "Towards the Rule of Law: 25 Legal Reforms for India" . The Vidhi Centre for Legal Policy, represented by Senior Advocate, Mr Arvind Datar, intervened before a Constitution Bench of the Supreme Court today in a writ petition filed by Common Cause, seeking legal recognition for Advance Directives, also known as living wills. Advance directives are instruments that allow a person to express her prior wishes regarding what medical treatment she should or should not receive at a future time, should she lack the capacity to make an informed decision then. Vidhi argued that the recognition of Advance Directives was a necessary extension of the right to life and the right to die with dignity under Article 21 of the Constitution, as well as the right to refuse medical treatment. Vidhi provided the Court with examples of legislation from other jurisdictions recognising advance directives and asked the Court to lay down guidelines that would grant legal validity to Advance Directives while also preventing their misuse. A copy of Vidhi's written submissions is available here. Vidhi's intervention application can be accessed here. With the retirement of Justice Khehar at the end of August, Justice Dipak Misra has been appointed the next Chief Justice of India. A Memorandum of Procedure on the appointment of judges, however, is still to be finalised. General Bipin Rawat was also named the Chief of Army Staff a few months ago, superseding two senior army officers. These developments give rise to questions about whether the seniority convention as an objective method of appointment should continue, or should be replaced with appointment based on merit. In this edition of Vidhi Dialogues, Justice A.P. Shah and Mr. Sushant Singh will discuss their views on ‘Seniority Convention and Appointments to High Offices’ and whether a better selection mechanism can be developed for these appointments. Justice A.P. Shah is the Chairman of the 20th Law Commission of India, and has served as the Chief Justice of the Delhi High Court. Mr. Sushant Singh is the Associate Editor at the Indian Express. He has earlier served with the Indian Army and as a peacekeeper with the United Nations. The dialogue is scheduled for 15th September, at 7 p.m., at the India International Centre, Conference Room II.